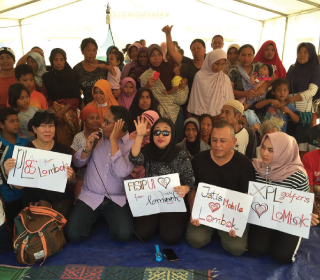 The action of caring for the earthquake victims that hit the community on the island of Lombok continued to flow from all corners of the country, not to mention donations from Informasi Teknologi Indonesia, PT or use to call Jatis Mobile. The CEO of Jatis Mobile Erik Rivai Ridzal took the time to directly hands over the donations and also convey deep sympathy and sorrow to all the people affected by the earthquake in Lombok. Jatis Mobile distributes basic necessities and cash for 1200 refugees in Kahyangan district, North Lombok. “We hope this assistance can ease the suffering on the people of Lombok,” add Erik.